Well.... looks like some information wasn't getting from one end to the other, even without the need for radios. Having to send a distress signal can't possibly be anything good.... though if they've been in space for two hundred years, I suppose their ship isn't in very good state.... Hmmm mysteries. The transmission of Justin Bieber's greatest hits was more than the crew of the Southern Sun could handle. I know I say it a lot, but your expressions are ON POINT, Roux! 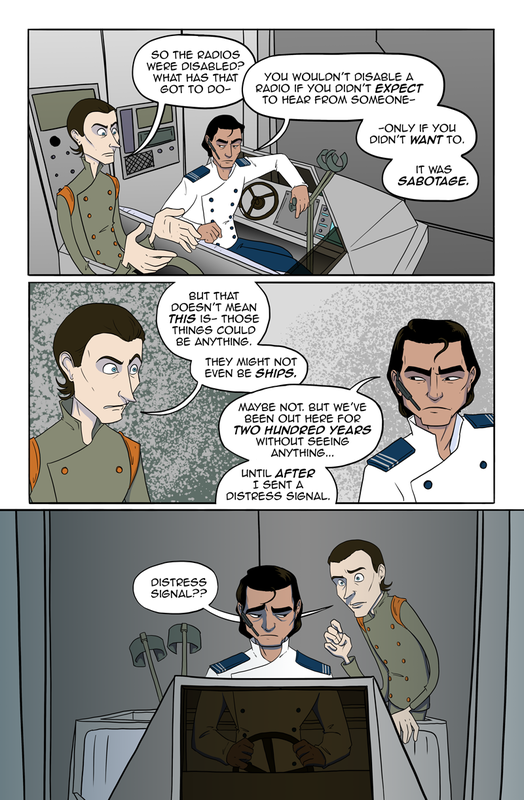 Especially Kalgan's in the bottom panel. I think it's also how you draw his posture and hands. Aaa thanks! I was really pleased with him in that panel and much less so with Mack. :P But I love hearing that, it's super important to me to capture expression well!! "How long have you been forty"
Oooh! Sabotage?! Distress signal?! Is there something you're not telling us Mack? I think there's something you're not telling us. There are so many things Mack isn't telling us. Why do we need a distress call Mack? This sounds just as important, if not more.